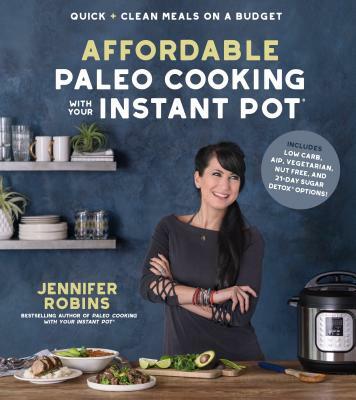 Jennifer Robins, author of the bestselling Paleo Cooking with Your Instant Pot®, is back with an all-new collection of knockout recipes that go easy on your wallet. Forget buying overpriced specialty flours and high-end meats; Jennifer shows you how to use easy-to-find, less expensive ingredients to create amazingly flavorful, healthy meals in half the time with your Instant Pot® or other multifunction cooker. Bursting with versatile recipe ideas to suit a whole range of nutritional needs and diets—including 21-Day Sugar Detox®, low carb, vegetarian, ketogenic and Autoimmune Protocol—this book has something for everyone. Breakfast is fast and fun with Pressure-Cooked Scotch Eggs, cooked in under 10 minutes. Enjoy incredibly tender Mixed Citrus Pulled Pork in under an hour, and get Chili Lime Salmon on the table in just 8 minutes. Crust-less Chicken Pot Pie is comfort in a bowl, and your guests will go crazy over Hot Minute Spinach + Artichoke Dip. These recipes make healthy eating easy and attainable on any budget, any night of the week.